We have been counted amongst the most trusted names in this domain, engaged in offering standard quality range of Cooling Manifold. Sara manufactures a range of Manifolds for applications like choke & kill, standpipe and high pressure pumping in sizes up to 4-1/16" and pressures up to 15, 000 PSI. Get A-Series Manifolds; AM-Series, Split-Flow Manifolds; FZ and BFZ-Series, High Pressure Fittings with us and experience the reduced installation time and system maintenance in effective and efficient way. Compact, state of art integrated manifold assemblies, which enable minimum piping for large flow capacity systems. Designed with smooth shifting, quick response, DIN standard slip – in cartridges. These manifolds result in shock free switching with reduced dead cycle time, system shock and system leakage. 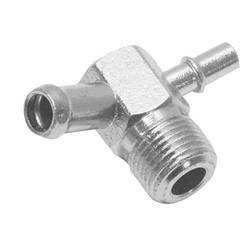 With an objective to fulfill the ever evolving demands of our clients, we are engaged in offering a wide assortment of Manifold Fittings. Three ranges of piping adaptors suitable for mounting the modular measuring valves, DDM1, SDM1, DDM5, SDM5, DDM15 and SDM15. 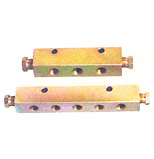 Available in 1 point to 12 point manifolds.Can be coupled for additional points. We are instrumental in providing excellent quality Manifolds, Which are used in lubricating line to fix metering cartidges of different capacity. These manifolds come in different number of ports i.e from 1 to 8 ports.